Welcome to the brave new world of forklift technology. The latest forklifts on the market (and others which will soon be available) have features that a forklift driver 50 years ago would’ve thought impossible. A recent Forbes article detailed a few of the newest lifts, and it’s pretty amazing what they’re capable of. these lifts literally drive themselves. For maintenance, intelligent forklifts let the driver know when an oil change or tire check is due. To make the machine perform better (and operate much safer), some intelligent forklifts can detect when a wheel slips, so power transfers to other wheels. To make a driver’s job easier, some new forklifts are programmed to know when the lift has arrived at the correct loading or unloading location. As the lift approaches, the forks automatically lift to the proper height, so the driver doesn’t even have to adjust the forks. Pretty amazing. This smart technology is also used for safety. 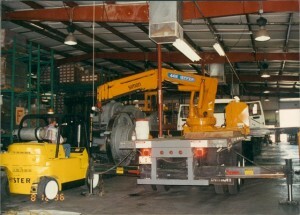 A forklift can be programmed to go slow at warehouse intersections, around bends and other critical locations. So even if a driver wanted to speed around a corner, the lift slows down to a safe speed. Maintenance, performance and safety – these are just three areas where intelligent forklifts are making a difference. No matter how “intelligent” forklifts get, employers still need smart, capable drivers on the job. And that’s just one reason why companies like Harley-Davidson, U-Haul and Verizon depend on Certifyme.net to provide OSHA-compliant forklift training sessions. Plus, with new lifts constantly hitting the market, drivers must be able to keep up with OSHA’s regulations and the forklift technology. We can help on both of these fronts. Our online courses are popular with small and large companies, and they’re also very affordable. Interested in signing up for a forklift training course? Or maybe you have a few questions about what topics are covered, how much it costs or anything else. Our customer service team is ready to help. Call us at (888) 699-4800, or visit our contact page to send a secure email message. Thank you for visiting our website and reading our blog.